Grey made this cake from a Cook’s Illustrated recipe. 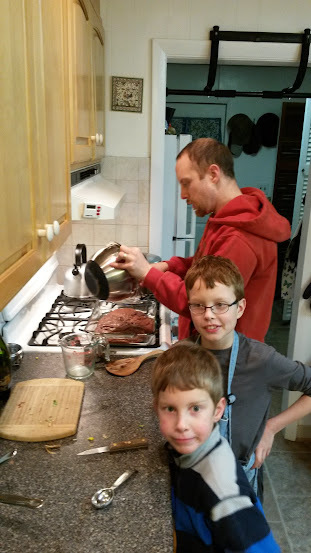 At 9, he’s already a better cook than I was when I graduated from college. So you might have heard that New England is looking at a wee bit of snow tonight. Just a trace. Hardly more than two feet, with hurricane force winds. I mean, barely hurricane force – no more than Category 1! Tonight, the great city is quiet. The blanket of softening snow has begun to fall, but the vast dimensions of the sky have not yet opened their portals to loose the flakes upon us. In another hour, by law, we will be contained to our homes with those children who lay slumbering in guaranteed-snow-day anticipation upstairs. There is no sound of traffic outside – no airplanes flying overhead. There is the hum of the furnace and the creak of a hundred year old house settling in the cold night air. The winds are sliding past – not yet howling or moaning. The house is warm and slightly messy – scattered with Transformers, stuffed animals, cables & little boys’ socks. The entire region on every side gives a great exhalation from the normal pace. We lay down our commutes and our schedules and our appointments. We forgo our childcare. We do not go into work. (Although – curse of the age – work we must tomorrow since our labors depend hardly at all on our physical location.) In the morning the world will be transformed into twisting snow, cutting us off from the burdens and comforts of our society and demanding that we take a few moments to think of who we are and what we are doing in this world. We will shut the doors against the icy gale, but open the curtains to see the power of the storm. Before the world resumes anew there will be shared meals, laughter, sledding, video games, board games and baked goods. Some of those moments will soak into the souls of my young sons, and become the definitions of winter, of storm, of blizzard. Assuming the power stays on (we’ve never **knocking on wood** in the seven years we’ve been there had the power go out in any meaningful way), this storm will be for us an interregnum. A gift. (I know it won’t be that way for everyone. We are very lucky in our circumstances.) For us it will be a time set apart. Tomorrow, I’ll probably live-blog it for you – not so much because I think you’ll be fascinating, but because our era allows us to feel most connected when we are most apt to be isolated. I’ll tell you whether it’s a lark, or getting a bit scary. We’ll ponder together the likelihood of school on Wednesday (low). We’ll be joyful and funny and snowbound together. Tonight, I feel great gratitude for the circumstances of this storm, that brings us together even more than it keeps us apart. I am surprised to find that we will not get much of it here in Iowa. We show clear skies and 40 tomorrow! It does make up for the crazy ice storms that seem to be a yearly thing. I do recall a day when we woke to no electricity and a truck with a loudspeaker advising us to conserve water, as the little town we were living in at the time had limited reserve in it’s tower. We were also trapped at the end of our little cul-de-sac with downed cables in the road. We were fortunate that our furnace still came on, just no fans- being in the basement, it rose and kept us at a nice 55. I read a Harry Potter book while we all dug out those neglected things that did not require electricity or internet, not much in our home. I do not think we would make a very good Amish family. The amusing thing is that when the Electric Co. got around to checking out our wires, it turned out to be a phone cable to the hermit at the end of the road that didn’t have his phone turned on anyway. So we all got an enforced day off and had fun. I am sure you will make the best of it! Can’t believe I’m saying this but I remember loving snowstorms as a kid, inside cozy warm and fed. Knew you all would be gaming. I love your writing. I was watching the news last night and in Chicago, your storm was big news. This internet is a crazy thing, as I sit there watching, and though we have not met, I wondered how Brenda and her family were doing! I love that about the internet! Of course, you knew I wouldn’t leave you to wonder….